Find out why millions of people around the world have for centuries turned to apple cider vinegar as a powerful remedy for treating many of their most common health conditions and learn how you too can use it to resolve many of your own health complaints. For centuries, apple cider vinegar has been used as a folk remedy to treat a host of health issues, from indigestion and low energy to sore throats and toothache. It is also a remarkable beauty aid that can help remove unwanted blemishes and add strength and sheen to hair. And that’s just the tip of what this amazing elixir can do. This book begins by looking at the long history of apple cider vinegar use and examines the science behind its many benefits. It then explains how you can choose the best apple cider vinegar, and even tells you how to make it at home. The main section of this book is a complete A-Z guide that shows you how to use apple cider vinegar to prevent and reverse over 80 common health conditions, and to improve and maintain the health and appearance of your hair, skin, teeth and gums. Each entry includes a clear discussion of the topic, explains how and why apple cider vinegar works to help each condition, and then guides you on how to most effectively use it. 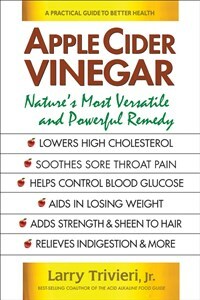 Apple Cider Vinegar is the most complete and comprehensive book of its kind. By applying what you will learn in it, you will take an important step to better and longer lasting health. "[A] handy guide to the many practical uses of this substance for health and well-being. Thoroughly accessible to readers of all backgrounds, Apple Cider Vinegar shows how this inexpensive substance can ameliorate everything from blood cholesterol to nasal congestion, indigestion, gum disease and much more. An index for ease of use rounds out this excellent supplement to health and home remedy shelves."